After (finally! 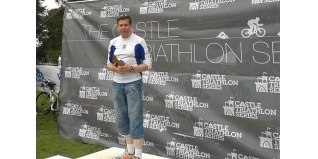 ), getting back into triathlon racing action after years of serious health problems, Bob Holloway (check out his columns HERE), didn't want to leave 2014 with just one event, and so decided to race at the Hever Castle Triathlon on Saturday - and came away with some added motivation to fuel the fire for 2015. If you'll excuse the cliché, my blogs these days are a bit like buses. You can wait ages but then two come in quick succession! After a fair outcome at the Cotswold Sprint several weeks ago, I decided that there was still life left in the old dog yet. I scoured for events in September and came up with the Hever Castle Super Sprint which, being unfamiliar with the event, led me to think that it would be a chance to test my race speed. The swim was short, only 400m, as was the run at 4km. And how hard can a 12.5 mile bike be? If only I knew then what I know now! The alarm went off at 5.30 and an hour later Mrs H and me were heading down the M25 to Hever Castle. Parking and registration was a doddle and I was soon in transition setting things up. The first mishap of the day was somehow ripping a great slit in one leg of my Foor Synflex. I blame my bulging calf muscles after all the hard work on the turbo! A short walk down to the swim, a 10 minute race brief and it was into the 15 degree murky water of Hever Lake. Ok, it was cold, but not ice-cream headache cold. I took a place near the front and only managed to wrestle with a few fellow competitors over the first 50m. I soon settled into my cruising speed (no speed in the swim yet), and the rest of the swim was pretty uneventful. I exited the lake and made my way along the 100m long path to transition. Then mishap two occurred. In trying to get my arms out of the wetsuit I dropped my goggles and struggled to find them, so I left them behind for somebody to find a nice pair of Zogg Predators. The good thing about the swim was that there was not a repeat of the dizziness and sickness that I suffered the other week. The bad thing about the swim was that half way along the path to T1 my Garmin said 11m 26s. I've been doing 6m 30s 400m swims in the pool, so why was I slow? The answer, according to my Garmin, is that I actually swam .36 mile, that is over 500m! On looking back, that made me feel a bit better. The transitions at Hever are quite long but it wasn't long before I was on the bike course, being careful not to puncture on any of the many speedhumps on the road out of the castle grounds. I soon got aero and made good progress passing many of the faster swimmers in my wave. We then came across the main hill on the course which saw me spinning frantically on the small ring. Folk had warned about the bike course having no flat sections and boy were they right. It was either climbing or descending all the way. My biggest gripe however, was folk drafting and riding in small pelotons making it impossible for cars to pass. I must have overtaken as many slow moving cars as slow moving bikes and all in all, I reckon I lost about two minutes from having to wait to overtake slow moving vehicles. My pre-race target had been to enter T2 in 54 minutes, but I missed that by four minutes after a 44 minute bike. By the time I left T2 there was a shade under one hour on the Garmin. Last year's ultra vets prize was won in 1 hr 23 mins so I knew I was in with a fighting chance of getting on the podium. But I started to change my mind when we started to ascend the dirt track which seemed to go on for ever. Once mounted though, I found a fair bit of pace and felt good. Still well short of decent race pace, but good enough to finish the run in 21 mins. The finishing chute was a welcome sight and having high five'd Mrs H and my daughter Gemma, I crossed the finish line in 1hr 21m 51s. Rob Walker of Channel 4 fame was loitering in the finishing chute doing interviews and I couldn't resist the temptation of telling him that he was no Annie Emmerson! After packing up, we headed over to the StuWeb tent to get a print out of my splits. This facility is something new to me and is a great boon so soon after finishing the event. On a separate computer was listings of each age group result, which was the first time I realised that I was in first position. Like most presentations, this one was late and probably half of those who should have been there, weren't! But I wasn't going to miss my moment of glory! For my efforts, I was handed one of those nice glass cubes with a hologram picture inside. I was also given a voucher for 50% off next year's event. To be honest, there were times on the bike and run course when I would have been pleased never to tread or ride the same path again. But maybe I should return next year to defend my title! OK, quality in this event does not run deep but it's is a great event for those dipping their toes into the murky world (and Hever lake), of triathlon for the first time. So I'm not getting carried away with the win. A win is a win I know, but I know that I can do better which is why after a week's rest, I'll be hitting the roads for a solid winter's training ready for some faster racing next year.